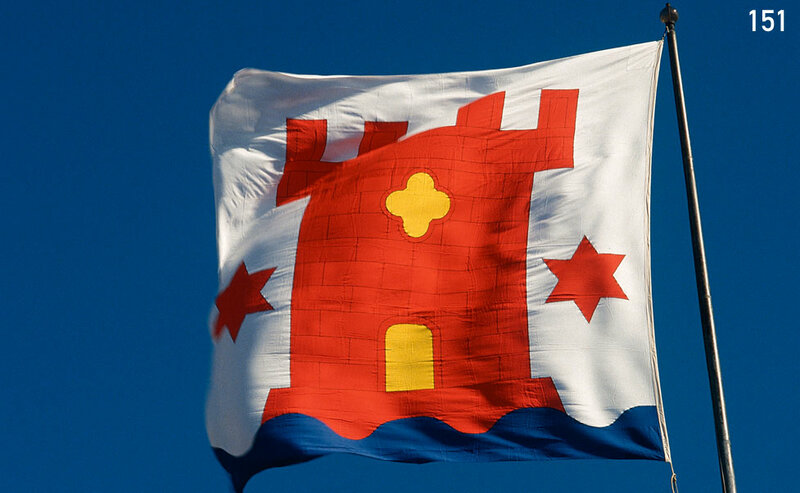 The flag of the municipality of Kalmar (in English sometimes spelled Calmar) can be seen at ftj.se . It is a banner of the arms of Kalmar. Kalmar is a very old town, and the arms are the oldest known municipal arms in Sweden, from the 13th Century or so. According to some sources, Kalmar was for a short time a member of the Hansa and Kalmar was also the site were the treaty of the Union of Kalmar was made between Denmark, Sweden and Norway (hence the name of the union). Kalmar is the county capital of the County of Kalmar (Kalmar län). As I had mentioned, I had seen both being used in English, but more often with the K spelling. Having a vague sense that the C spelling might have been encountered more often in older works, I did a little checking at Google Books. So, yes Calmar was once the preferred English spelling, but by at least a 30 to 1 margin it no longer is that. It might still qualify as an acceptable variant, but if so it would be by the skin of its teeth. If it is not yet totally obsolete, it will be soon. So my recommendation would definitely be Kalmar for the webpage.